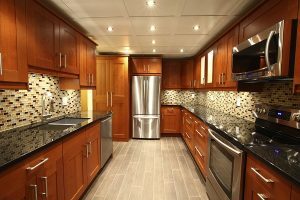 How Long Does It Take To Remodel My Kitchen? Understanding how long a kitchen remodel takes can make the process a lot easier! Remodeling a kitchen is a big decision that impacts your current and future quality of life. In fact, most homeowners want to enjoy their homes. Here are some facts on how long it takes to remodel the average residential kitchens. The planning and design phase can last for a few days or a few months, depending on what you want and how confident you are in your choices. You need to make sure that you are totally comfortable with the final design before moving past this stage. If you aren’t sure what you want or jumped in too quickly, this planning and design phase could last quite a while. However, never let a contractor push you through this stage if you aren’t ready. Depending on the materials you want to use, they might have long lead times that increase the amount of time that your kitchen remodel will take. Custom cabinets, for example, can easily take 3-4 months to build and ship to your home. Even semi-custom cabinets can take over a month to arrive. Depending on the products you use, prepare to wait a while for everything to arrive. This entry was posted on Friday, March 24th, 2017 at 12:02 pm. Both comments and pings are currently closed.